I don't really believe that Rice Krispies and chocolate belong together. I also believe this a little less vehemently about wafers combined with chocolate. 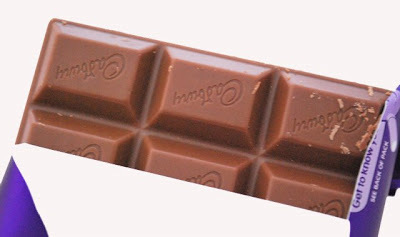 The chocolate most often turns the crunchy layer all soggy and it's not like the mild flavor of rice krispie or sugar wafer has a chance against chocolate. The wafers, however, float in the super light whipped cream center of the Nestle Lion Bar maintain their crunch and the krispies balance the sweet of the caramel layer. It was a wonderful surprise. I wish I could find these more often. This Twix Triple Chocolate was a bit of a disappointment. Though abounding with chocolate in three consistencies- chocolate cookie, chocolate caramel, chocolate coating- none of the three flavors really satisfied a true chocolate craving. These were wimpy chocolate flavors. 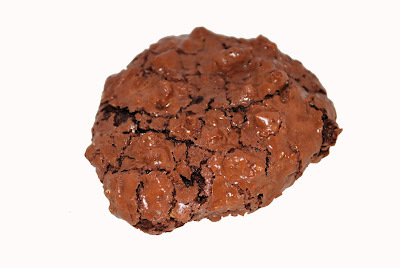 The cookie only packed a little cocoa punch and lost the buttery notes of the original. The caramel was pretty good but again seemed to flirt with chocolate flavor and then recede to its caramel safety zone. The original chocolate coating- the only element of the bar that remains true to the original Twix- is rich and delicious as always, but gets lost mixed in with the subpar cookie and caramel. I'd choose the traditional Twix (or old school Peanut Butter Twix- the new peanut butter consistency is simply not the same) over this variety every time. I've had some negative experiences with various flavors of Pachitto Hi-Chew candy (see custard pudding or golden apple). The lemon flavor, though, blends perfectly with the dense consistency of the chewy rice candy (think of chewing a starburst, and then double the jaw strength necessary), offering a mellow, almost milky citrus tang. Refreshing and unique but somewhat bordering on bland. These Wonka Nerds Bumpy Jelly Beans are something truly special. I wish I had a neverending supply. 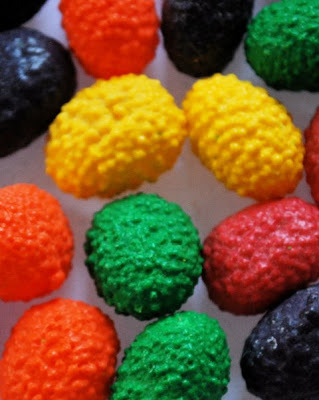 The flavors are mouth-tingling bursts of synthetic yet delightful Nerds flavors- perhaps the artificial fruit ideal? The crunch adds an exciting balance to the chew of the jelly beans. I'm surprised no one thought of this before! These tie with Starburst Jelly Beans as my favorite of all time. It goes in crumbly and brittle but quickly becomes such a lovely smooth texture as you chew. This Clark's Teaberry gum is addictive. The initial super sweet wintergreen burst is really pleasing for about five minutes. The flavor fades, though, into a pretty unpleasant aftertaste. I immediately wanted more of that fresh sweet taste and soon rationalized that eating one stick means finishing the pack. Thanks, Molly, for introducing me to this classic that I somehow missed! Check out The Victory Old-time Candy Store's history of the century old gum. A heartfelt cheer for Rice to Riches at 37 Spring Street in New York. As the sign indicates, this Rice Pudding shop is serious about its sweets and the result is a never-ending array of enticing new flavors of well-made rice pudding. Read a few of the many flavor and see if your mouth starts watering: Coconut Coma; Understanding Vanilla; Stubborn Banana; Fluent in French Toast. They're all pretty wonderful but I'm a traditionalist and tend to end up with Cinnamon Sling with Raisins. For a good review, read the New York Times coverage of the shop's opening. Mmmm, these are so delicious! Kit Kats have never been among my candy bar treats of choice- the cookie is so light and I want to dig into something substantial in a chocolate bar. But these limited edition Kit Kat Caramels are delightful. The caramel adds a little weight to the cookie layer, balancing the bar perfectly. I love these and hope they become a permanent, rather than limited edition, product. I embrace the synthetic nature and potential of candy, and enjoy any product that embraces its artificial origins. Topps Wild Berriez Wazoo bar is a fantastic representative of this rarely-supported class of candy and packs a great flavor punch. The tart wild berry flavored sugar rocks that top the bar closely resemble nerds and add a necessary crunch to the mix. The consistency of the multi-layered bar reminded me of those protein packed metrx bars- dense and chewy nougat that kind of crumbles as you chew. The whole combination is surprisingly delicious, and besides its wonderful technicolor aesthetics, I'd recommend the Wazoo as a light fruity substitute for a chocolate bar. For further thoughts on the Wazoo, you can read a great review on Typetive's Candyblog. More magic from the Bellovin kitchen! Usually the beauty of a rainbow cookie is overshadowed by how dry it tastes. Not these! They're amazing. I'm usually pretty enthusiastic about the idea of adding marshmallow to anything, and I've been keeping an eye out for these limited edition Snickers Rockin' Nut Road bars for awhile. Luckily, my friend Dan used his uncanny eagle eye for exciting candy and discovered one for me at a local pharmacy. He has the best candy karma. Despite my high anticipation, I was disappointed. I like the dark chocolate, and the traditional caramel is fantastic. Old school Snickers are great, and I loved their foray into Limited Edition with the Snickers Charged. Sadly, the marshmallow nougat displayed none of the gooey sticky consistency I had expected . Instead, it was almost crumbly and I kept detecting a note of coconut in each bite that just didn't belong in the mix. The primary test? I didn't even feel like finishing it. The flavor of this new Orbit Mist Mango Surf starts off so promisingly with a strong, tart burst of Mango flavor. Unfortunately, the mint soon follows and these two flavors just taste off together. It's like mixing lemon juice and milk, the acidic taste of the mango plays off the mellow mint in an unnerving way. And as someone guilty of chewing gum long after the flavor disappears, the aftertaste is not good- reminiscent of the lingering taste after the delicious flavor disappears in a stick of Juicyfruit. I've gotta give Orbit kudos for really exceptional packaging, and as I've written about before, I'm a sucker for great wrapping. You open the calm blue packaging to reveal a torrent of concentric circles falling from the package interior to the wrapping on the individual sticks of gum. 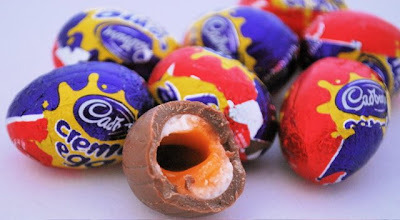 I've written before about my particular love of Cadbury milk chocolate. There's no contest in my mouth between Cadbury and the other big brands like Hershey's and Nestle. I'll always have a bias towards any chocolate candy made by Cadbury because I automatically know that I'll love the chocolate, whatever the company chooses to mix it with. 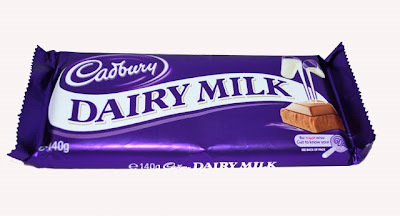 So I was thrilled when Kara, Mark, and Conor went to Ireland and brought back this beautiful slab of pure Cadbury Dairy Milk. It was finished far too quickly. 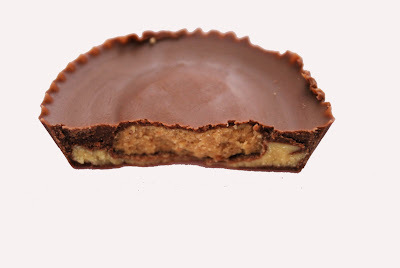 There's simply no way to go wrong with a Reese's Peanut Butter Cup in any form, and I welcome any holiday that provides inspiration for new variations of this perfect candy! Thanks, Dan! 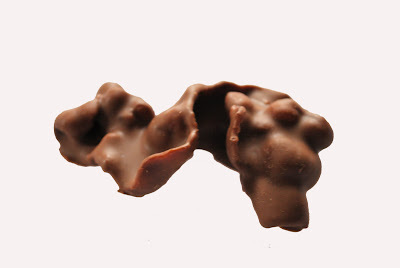 Adam made it his admirable mission to locate Ronie-Sue Chocolates and its celebrated Pig Candy, a decadent milk or dark chocolate-covered bacon. After multiple attempts- store closed and the like- he arrived home with a bag full of the stuff. My initial enthusiasm did not match his. Bacon is sublime and so is chocolate, but together? The first bite was exactly as expected. Delicious ingredients that I wished I could experience one at a time instead of in combination. It was a little like a chocolate covered pretzel with a greesy bacon tinge. About 10 minutes after trying the treats and dismissing them I was back. And it was better. I started noticing the perfect consistency of the bacon- crisp but not dry or brittle- and the way that the chocolate coating was tinged through and through with this wonderful smoky flavor. Within a couple days the chocolate-covered bacon was finished and I found myself back at Ronie-Sue's (we're talking maybe three days later at most) purchasing more of the addictive treat. And I'm going back again. I love Ice Breakers gum- the pleasing packaging, the sugary coating on the overly-large cubes of gum, the freaky flavors they dream up- and got really excited at the new Dragonfruit Freeze variety. I don't believe I've ever eaten a dragonfruit and am now a little less excited to do so. Without a point of comparison on realistic taste, I'll just say that the overall flavor of the gum is Tutti-Frutti. The unique dragonfruit flavor comes in, unfortunately, in the aftertaste, leaving a mellow musky flavor on your tongue that definitely does not mesh with the idea of gum leaving one's tastebuds refreshed. The aromatic musky notes leave your mouth feeling less clean than when you began. And trust, adding more pieces to the mix doesn't help. 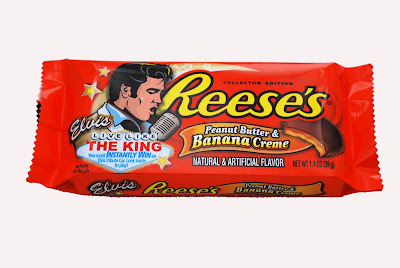 My dream came to fruition when my friend Dan turned up with not just one but twenty-four packages of the limited edition Reese's Elvis Cups flaunting a layer of Banana Creme! And these don't disappoint! Though the "Creme" lacks the ooze I had envisioned, the flavor blends beautifully with the peanut butter and chocolate. Surprisingly, this is not the blantantly synthetic banana flavor favored in candies like Laffy Taffy. Instead, it's a subtle and realistic banana, which can easily be lost under the more strident peanut butter. 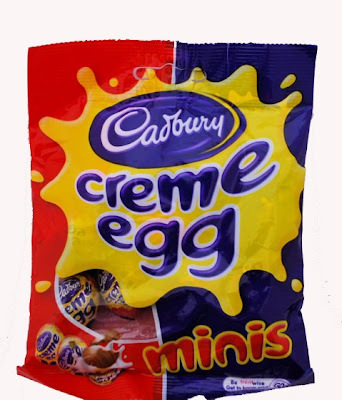 These are delicious and so worth a try if you can track one down. When it comes down to it, though, you really can't improve on the classic and if I had to choose I would always take the original version, subtle banana or no.